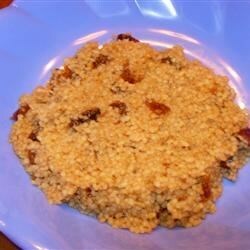 "My family loves couscous and this fruity variation is one of our favorites. This is also delicious with other dried fruit such as cranberries and apricots." In a 2 quart saucepan, combine chicken broth, water, dried cherries, butter, salt, and pepper. Cook over high heat until boiling. Stir in couscous, cover, and remove from heat. Let stand 5 minutes. Fluff with a fork, and serve immediately. I followed the recipe and only added parm cheese at the very end. It was very bland. It needs more seasoning. The fruit is nice and the chicken broth helps, but it needs something more. Very fast. We substituted Crazins (dehydrated cranberries)for the Cherries and everyone loved it. This recipe was great! What a great combination of flavors. I used dried raisins that were cherry flavored, like craisins, and it turned out perfect! Most importantly, it was so easy! Unless I really messed this recipe up, I thought it tasted like really good cranberry muffins, but not as sweet. Pleasent as part of a well planned menu. This was the biggest hit ever! I tried it with dried cranberries (and I added a lot more than required). This was great. The dried cheeries added a wonderful flavor. It is definitely a must try. It's so quick and easy.